The day started early, finishing up packing before breakfast and getting dressed for church. It was a struggle to get all the luggage packed into the bus, but somehow everybody and everything made it in time to the Cathedral. Bishop Tom, a well-known face from the previous days and the ice cream social, preached, giving special attention to Kids4Peace. Christian campers were able to participate in the service, lecturing and alter serving. 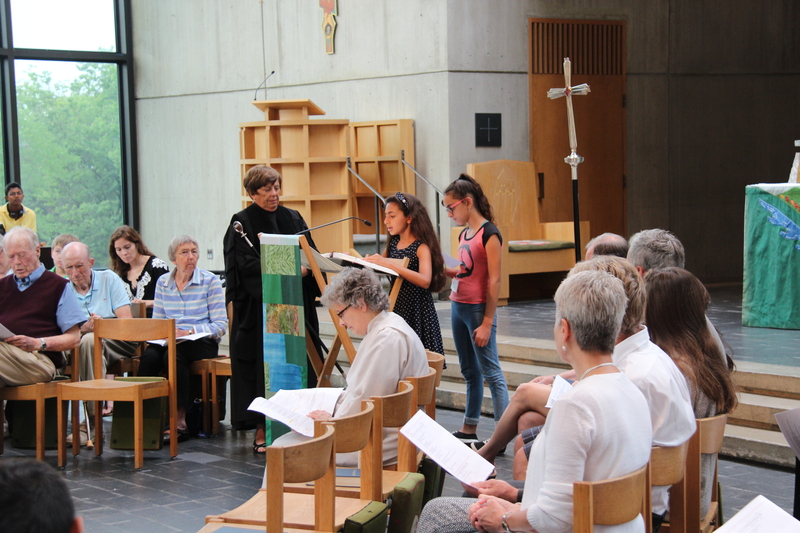 During the homily, the entire group performed the Kids4Peace chant as well as taught the congregation a song called Peace, Salaam, Shalom. Afterwards, the Bishop answered questions about the church, his vestments, and Christianity as well as demonstrated the rather complicated way of putting on his hat. When he finished, there was a line nearly out the door to try it on! After that, it was back on the bus for a short ride to the Ben and Jerry’s Factory! Two tour groups made up of campers and staff, marveled at the big machinery and sampled a delicious cup of caramel swirl chip in the flavor room. Respects were paid at the Flavor Graveyard, mourning the loss of some delectable blends. The next several hours were spent on the bus. Tired, hot and full of people, it was ride that tested everyone’s tenacity and tolerance. It took a bit longer than expected, but everyone arrived safety to New Hampshire. After a good dinner, the kids settled into their cabins for the night, eager to see their new surroundings in the daylight.